Gilad Atzmon wants you to keep those Four Figure Donations coming! PETITION! Call for the release of detainees in the Uprising in Iran! Ken O’Keefe has another (final) solution, and it’s amazing! What are CasaPound and the European Front for Syria up to? In 1929 Ben-Gurion said: “Jerusalem is not the same thing to the Arabs as it is to the Jews”. While he meant to say that Palestinians were not part of Jerusalem and are not attached to it as the Jews are, I would say, he almost got it right: Jerusalem is not the same thing to the Palestinians as it is to the Zionists. To us, Jerusalem is a home and an integral part of each of us, to the Zionists it is but another construction site, for he who loves a city would not destroy it as the Zionists are doing right now with Jerusalem. The distance between Sawahreh and Jerusalem is a relatively short one. Using a car, one would need 15 to 20 minutes, checkpoint stops excluded. Riding Sawahreh buses, which were old and rusty, it usually took us some 30 minutes, sometimes a bit more depending on the number of stops the bus made. We used to take the bus five days a week to go to school and come back home. On rainy days, the iron seats would be wet and cold, in summer they would be boiling hot. Nevertheless, my sister and I would race to find an empty seat near the window. We enjoyed the trip to Jerusalem, especially when the bus went up and down the Gethsemane Church road. To the left, facing the walls of the Old City, one would see the golden Dome of the Rock. It would get bigger or smaller as you go up and down the road. I preferred the trip up the road towards Ras Al-Amud. I would watch closely awaiting the point when the Dome would start appearing, seemingly out of nowhere. To one seeing this for the first time, it would be a nice surprise. And as the bus travels up the road, it gets bigger and bigger, till at the top of the road you have somewhat a full view of the Dome of the Rock. When I was at school, I enjoyed watching friends and relatives from Dheisheh and Bethlehem witness this miracle. A number of times, my sister and I were forced to walk all the way from Jerusalem to Sawahreh. On Saturdays there were usually fewer buses moving on the various lines, so a couple of times we had to walk back home after finishing classes. These “forced walks” were seldom, and although on foot it took us much longer to get to Sawahreh, and we would reach home completely tired and with burning feet, we enjoyed the walks. We would pass the walls of the Old City and the ancient tree which looked like something out of a horror movie. It is said that the tree is very old, and it does look it, but somehow it didn’t impress me. It looked more dead than alive, not like the green olive trees or the bloomy almond trees you find in Palestinian fields and on hilltops. From the point where the tree stood, one had a marvelous view of Mount of Olives and the Palestinian neighborhoods in the area. Josef Weitz, the polish director of the Jewish National Fund’s Land Settlement Department in charge of illegal Zionist colonization in Palestine and the Ethnic Cleansing of Palestinians, wrote in 1940: “among ourselves it must be clear that there is no room for both people in this country. After the Arabs are transferred, the country will be wide open for us, with the Arabs staying the country will remain narrow and restricted …. There is no room for compromise on this point … land purchasing … will not bring about the state … the only way is to transfer the Arabs from here to neighboring countries, all of them, except perhaps Bethlehem, Nazareth, and Old Jerusalem. Not a single village or a single tribe must be left. And the transfer must be done through their absorption in Iraq and Syria and even in Transjordan. For that goal, money will be found – even a lot of money. And only then will the country be able to absorb millions of Jews …. There is no other solution.” In addition to calling for the transfer of Palestinians, Weitz claimed Old Jerusalem is to be “spared” the ethnic cleansing, but facts on the ground tell a completely different story. Since its establishment, the Zionist state has been implementing a systematic policy of Judaizing Jerusalem and ethnically cleansing its original Palestinian residents. Even when spreading propaganda about an empty land waiting for its long lost sons to come back, Zionist leaders admitted among themselves that the land was populated and was prosperous. English Zionist Israel Zangwill, famous for his quote: “Palestine is a country without a people; the Jews are a people without a country”, which later became the infamous Zionist slogan: A land without a people for a people without a land, said in a speech to a Zionist group in the UK in 1905: “Palestine proper has already its inhabitants. The pashalik (province) of Jerusalem is already twice as thickly populated as the United States, having 52 souls to the square mile and not 25% of them Jews”. In 1948 Israel occupied 85% of Jerusalem and forcibly expelled up to 80,000 Palestinians from their homes in West Jerusalem and 40 other surrounding villages. The villages were then destroyed to prevent their inhabitants from returning back to them, and their property was transferred to the Israeli state under the “Absentee Law” of 1950. In 1967 Israel occupied the rest of Jerusalem, and established the first illegal Jewish settlement inside the Old City. More than 700 Palestinian homes and buildings were either destroyed or expropriated. Alone in the Mughrabi Quarter of the Old City, over 6,000 Palestinians were evicted and 125 houses were destroyed in order to create a plaza in front of the Western Wall. Israel doubled the size of the Israeli municipal boundaries of the city by annexing 70 km² of lands belonging to 28 villages in the West Bank. In 1980 Israel annexed East Jerusalem officially, and in subsequent years Palestinian properties in Silwan and the Muslim Quarter of the Old City were turned over to Jewish settler organizations. Despite UN General Assembly Resolution 2253 ordering Israel “to desist forthwith from taking any action which would alter the status of Jerusalem”, the Israeli government confiscated over 60 km² of Palestinian land in East Jerusalem (i.e. 86.5% of its total land area) over the years for Jewish use. We often used go to the Old City, either for shopping or just to enjoy the beauty of the narrow streets and alleys. Beautiful old facades would meet one all the way, with beautiful architecture that is the trademark of the Old City and a reminder of its Arabic heritage. This Old City is nothing like the Old Town Centres one would see all over Europe, from which illegal Jewish settlers come, and into which they are trying to turn Jerusalem. Two of my childhood friends, who are also sisters, live in the old city. They are originally from Sawahreh who each married a Jerusalemite and moved to Jerusalem. The first time I went to visit them I was shocked at the state of their dwelling. They had a relatively big house in Sawahreh, and although they grew up in a large family, there was enough space inside and around the house for everyone, so one didn’t feel imprisoned. Now, they both had families and each was living in a room with her family, sharing the rest of the house with other family members. There was no place for privacy there and the over-crowdedness was unbearable. One of them lived in a room built on the roof of the family house. We had to climb a ladder to enter the room, which was divided into smaller rooms in an effort to give it the shape of an apartment and provide some privacy. We went for a walk inside the Old City and every now and then my friends would point out some neighbors gathering in the narrow streets in front of their houses or children playing in the streets, and talk about how people here have little space and the children have no gardens or playgrounds. Many houses are in such a miserable state and need renovation but often the municipality doesn’t allow it, using this as yet another method to force people out of their homes. Although Palestinian Jerusalemites have to pay taxes, they receive very little municipal services in return. According to B’Tselem: “since the annexation of Jerusalem, the municipality has built almost no new school, public building, or medical clinic for Palestinians.” …. “Entire Palestinian neighborhoods are not connected to a sewage system and do not have paved roads or sidewalks”. During my last visit to Palestine, and despite their continuous invitations, I was not able to visit my friends in Jerusalem and had to be content with seeing them in Sawahreh. When their brother was preparing to leave to Mecca for the Hajj season, the whole family came to say goodbye, except one of the sisters. Although she had been married to a Jerusalemite resident and living in the Old City for more than 10 years, she only possesses a temporary permit allowing her to reside in the city. This permit has to be renewed again and again, and it happened that her permit had expired and as she was waiting for a renewal, she couldn’t come and say goodbye to her brother. She didn’t want to risk being caught at one of the checkpoints and arrested for not having the needed papers and maybe lose her right to live in the city forever and thus be disconnected from her family. According to Israeli law, Palestinian Jerusalemites, although born in Jerusalem like their ancestors before them, hold the status of “permanent resident”, giving them the same status as foreigners wishing to live in the country, while illegal settlers are given the status of citizens. There is also a distinct policy of discrimination in planning and building regulations applying in Jerusalem. Outline plans for Palestinian neighborhoods prepared by the Israeli Jerusalem municipality have a common feature, i.e., about 40% of the area is designated as “open landscape area” where building is not allowed. For Palestinian building purposes, only some 11% of the lands of East Jerusalem are allocated for Palestinian use, and these are already over-crowded building areas, similar to the demarcation plans of the IOF for Zone C in the West Bank. In addition to the rarity of obtaining building licenses, Palestinians are forced to build “illegally” on their lands. While illegal constructions built by settlers are adjusted into building plans to make them retrospectively legal, Palestinians are not given permits to build on their own lands. As illegal settlements expand, Palestinian communities in Jerusalem and around it are prevented from building and expanding, thus limiting their natural expansion and strangling them. According to a report of the Society of Arab Studies published in early 2008: Israel had had demolished 8,500 Palestinian houses in East Jerusalem since 1967, and alone between January 2000 and September 2007 some 786 Palestinian houses had been demolished, leaving thousands homeless. Another 20,000 houses are threatened to be demolished under the pretext of illegal construction. B’Tselem statistics on building starts in Jerusalem for the period 2000 to 2006 show that of the 14,472 registered building starts, 11,114 were in Jewish neighborhoods, while only 3,358 were in Palestinian neighborhoods. In addition, housing density in Jewish settlements in East Jerusalem was 23.8 m²/person in 2002 in comparison to a housing density of 11.9 m²/person in Palestinian neighborhoods. Over-crowdedness is not a feature restricted to Palestinian houses of the Old City, but applies to most Arab dwellings in Jerusalem. As far as I can remember, all of my classmates whose houses in Jerusalem I visited lived in small apartments either in old houses or in multi-apartment buildings. One friend lived in the second floor of a two-story typical Jerusalemite house, close to where religious Jews lived. Often when visiting her, we would encounter groups of these religious Jews with their typical long black clothes, back hats and long beards. The women wore head scarves, long skirts and wool stockings even in summer. The part of the house she lived in was even too crowded for the small family, but I found it brave of them to continue living there, despite their closeness to these settlers. Other friends lived in other parts of the City, all in small apartments. I always wondered why they lived in such apartments when they were attending private schools that cost much money, when their parents brought them to school in fancy cars and when they always wore beautiful expensive clothes. If they had the money to buy cars and nice clothes, they could afford bigger apartments. I had no idea about the building restrictions and all the taxes Palestinians were subjected to in Jerusalem. I think in their shoes, I would rather choke in an overcrowded room rather than leave Jerusalem of my own free will. The Israeli Jerusalem Master Plan of 2000, serving till 2020, aims at imposing Jewish character on the city and diminishing the Palestinian population to 12%. According to the plan, the total city area is 142 km² and the boundary of the western part of the city is extended by 40%. 24.4% of East Jerusalem is zoned as “green natural” area where no building is allowed. Currently, Israel is undertaking a massive eviction and demolition process in East Jerusalem neighborhoods. In 2007 the Israelis started the construction of a Jewish settlement inside the Old City’s Muslim Quarter with more than 20 housing units and a domed synagogue. Nearby in the so-called “Holy Basin” area, Palestinians are systematically being thrown out of the area, extending from the Kidron Valley, the Mount of Olives to nearby Palestinian neighborhoods, and replaced by Jews. This March, two more houses were evicted in Sheikh Jarrah, and 88 houses in Al Bustan neighborhood in Silwan are to be evicted and demolished. Thus, over 1,500 Jerusalemites will be made homeless to make place for a national garden. Similar destiny awaits 60% of the houses in the Wad Hilwa neighborhood in Silwan. Leaving the Old City, and going up the Gethsemane road, one would reach Ras Al-Amod and Silwan. To separate Jerusalem from the surrounding Palestinian environment, a ring of Jewish settlements has been created in and around the Old City, expanding from the Jewish Quarter to the illegal settlements in Ras Al-Amud and Silwan and the Jewish Cemetery on the Mount of Olives. In Ras Al-Amud Palestinian houses next to the Jewish Cemetery are separated only by a low wall. Here, dead Israelis have more rights and more place than living Palestinians. I remember the Israeli police station opposite the Jewish Cemetery. As I grew up, I watched that police station change into a “prison”. It was a simple building at the beginning, later to be surrounded with barbed wire. Then there was a checkpoint installed opposite it. No wonder these policemen don’t feel safe here, I always thought upon passing the police station, this land doesn’t belong to them and deep inside they know it. This police station was planted in the heart of Palestinian neighborhoods, with only dead Israelis in the nearby cemetery as company. They would stop Palestinian buses and cars and delay people going to work, school and hospital. After 1967, lands belonging to the Al-Ghoul family were confiscated and sold in 1990 to US Jewish millionaire Irving Moskovitz who developed a plan for the construction of an illegal settlement with 132 housing units on 14,7 Dunums of the stolen Palestinian land. The plan was frozen for some time because of its sensitive nature, only to be approved in 1999 by none other than Ehud Barak. As shameless as they are, the illegal Jewish settlers named their illegal settlement Maale Zaytim, or Olive Heights, maybe in celebration of the thousands of olive trees they uprooted from Palestinian fields to build their illegal settlements. This settlement aimed at forming continuity with the Jewish cemetery opposite it and other illegal structures on the Mount of Olives, thus contributing to the ethnic cleansing of Jerusalem. The first illegal settlers moved into the settlement in 2003. In 2005, while the Palestinians were busy “negotiating” peace with Israel, the settlers and the IOF were busy dividing Palestinian land among them. 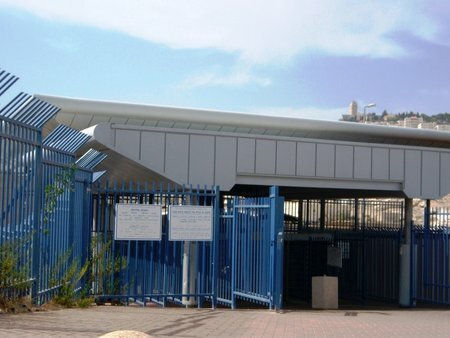 The police station in Silwan was turned over to settler committees and incorporated in Maale Zayton, in exchange for a new one that was built in the E-1 area. According to ARIJ, Palestinians in Ras Al-Amud are only allowed to build on 55-65% of the total land area whereas the settlers are allowed to build on 115% of the total area. Also, the Palestinians are allowed a maximum of two floors per housing unit, while the settlers are allowed a maximum of seven floors per housing unit. Many Palestinians were twice ethnically cleansed from Jerusalem; first from West Jerusalem and later from East Jerusalem. Many of those who were forced out of West Jerusalem and settled in East Jerusalem are today threatened with eviction on the invented ground that the land doesn’t belong to them. At the same time, illegal Jewish settlers, coming from the United States, Europe or anywhere else in the world have a right to a city in which neither they nor their ancestors own a handful of earth. Today, Palestinians make 34% of the total population of Jerusalem, while 55% of the Jewish population of the city lives in 34 illegal settlements in and around Jerusalem. Of the total population of the Old City, only 9% are Jews. Travelling to Bethlehem through West Jerusalem, one would leave the typical Palestinian Arab landscape of East Jerusalem and enter an artificial one. Travelling this road, I used to think that this must be what Europe looks like. It was nothing like East Jerusalem, Bethlehem, Ramallah or any part of Palestine that I knew. It had nothing of the magic of East Jerusalem that attracts one and leaves everlasting memories. Although we used to travel this road frequently some 20 years ago, the only recollections I have of it are some scattered images of similar tall grey buildings that showed neither beauty nor good taste. Now, after seeing Europe, I know that the Zionists were not even able to imitate European cities. After destroying Palestinian Jerusalem, all they were able to create in its place was a shapeless town planted with building after building, their boring rhythm interrupted by more colorless side-roads and stores. The only houses worth watching were the few Palestinian houses confiscated but left undamaged. They were old, beautiful, built by Palestinian hands and now illegally occupied, and most probably shown to tourists as examples of Jewish architecture or Jewish existence in the city. They were the originals that stood like islands surrounded by seas of artificial architecture. The beauty of these houses lay in the fact that they were so in place, while their surroundings were strangers to the land. 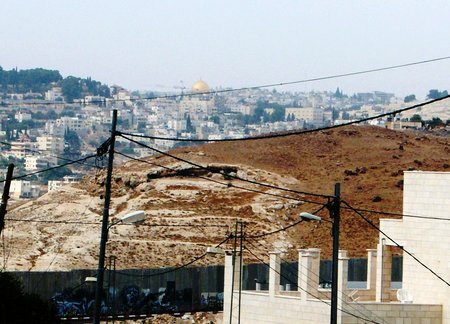 To further its policies of Judaizing Jerusalem, measures and plans have been instrumented to cut East Jerusalem from the rest of the Palestinian Territories and prevent the establishment of a contiguous Palestinian state, including land confiscation, illegal settlement activity, the Apartheid Wall, house demolition and revoking residency rights. After 1967, Israel activated the “Land Ordinance” of the British Mandate to confiscate 85% of the lands within the illegally expanded Jerusalem area. The original area of West Jerusalem tripled and the municipal boundaries of East Jerusalem were expanded from 6.5 km² to 71 km², to include large territories with minimum Palestinians. So, while densely populated Palestinian communities were excluded, the lands of these communities were included within the new illegal boundaries. At the same time, settler organizations were allowed to build settlement cores inside Palestinian communities such as Silwan and Sheikh Jarrah. This January the IOF issued orders to annex 24 Dunums from lands belonging to Husan and Nahhalin villages in Bethlehem in order to expand the illegal Jewish settlement Gush Azion. This comes as part of the “Greater Jerusalem” scheme, which aims at annexing more Palestinian land to Jerusalem and expanding settlements. So far, this plan has annexed 72,000 Dunums of Palestinian land. Further Palestinian land was confiscated for the construction of an illegal tramway that will connect illegal settlements in the West Bank with Jerusalem. This will be a Jewish-only tramway system. An additional 19.2% of land owned by Palestinians in Jerusalem and 5.3% of Palestinian owned West Bank land were illegally confiscated by Israel for the construction of the Apartheid Wall. This Wall runs along the illegal Jerusalem municipal boundaries set by the Israel, including East Jerusalem and the annexed parts of the West Bank. By September 2007 11,100 Dunums were confiscated for the construction of the Wall and 40,985 Dunums will be disconnected from their owners. Upon completion, the Apartheid Wall around Jerusalem will be 181 km long. This wall affects the daily life of 27 Palestinian Jerusalemite communities. Dozens of Palestinian houses have been demolished because of the Wall and many more have received demolition orders.15,000 Palestinians with Jerusalem IDs living outside the Wall will be denied access to Jerusalem and 1835 families have been forced to move home. According to a report of the Civil Committee of the Rights of Palestinians in Jerusalem published in September 2007: 21.4% of the Palestinian families have been separated from relatives by the Apartheid Wall (15.5% inside and 32.6% outside the wall). 18% of the families live apart from the father and 27% of them apart from the mother. And 25% of the Palestinian-owned shops have been closed down due to the restrictions on Palestinian movement and the high taxes Palestinians living in Jerusalem have to pay. More than 100,000 Palestinians live in towns and villages around Jerusalem. These areas have always been an integral part of Jerusalem, and depended on the city for their livelihood. Through the construction of the Wall they lost access to their businesses, schools and hospitals. Also, many residents of East Jerusalem own lands in the surrounding villages. Because of the housing shortage and the over-crowdedness in East Jerusalem, they were forced to build houses around Jerusalem, which now lie behind the Wall. Sawahreh is one of the Palestinian communities affected by the Apartheid Wall. Many families have been separated because of Wall, and others have been forced to leave their own houses and share dwelling with other family members in Jerusalem, so as not to lose their Jerusalem IDs. In my neighborhood alone, several houses stand empty, among which are 3 houses belonging to one family. The family from West Sawahreh has lands in East Sawahreh, like many others families here, both parts of Sawahreh having been one body before Israel decided to divide it and divide the community. With the family growing, and the sons getting married and establishing families of their own, the family house in West Sawahreh was getting too crowded. West Sawahreh lies within the Israeli municipal boundaries of Jerusalem, and thus building permits for Palestinians are rarely given. Each brother built a separate house for his family in East Sawahreh, and the remaining piece of land around the houses was planted with trees. Nearby stands the house of another neighbor, the eldest son of an East Sawahreh family who married a relative from West Sawahreh some twenty years ago. All these houses stand empty now. Their owners, who carry Jerusalem IDs, are forced in live in overcrowded rooms in West Sawahreh because the Jerusalem municipality gave them the choice of living on their lands behind the Wall or losing their Jerusalem IDs. The inhabitants of Sawahreh, whether East or West, have always considered themselves part of Jerusalem, and for those among them carrying a Jerusalem ID, the loss of this ID would mean losing their natural right to the city. But this is not all. Inspectors from the Israeli Jerusalem municipality often come announced and check the dwellings of these families, if they actually live there, and interrogate them about their daily life. One friend told me that she came back home one day after an appointment at a health centre to find the municipality employees waiting for her. They insisted on knowing where she was and what she was doing and this was not their only “visit”. Many Israelis have double citizenship, and spend most of the year in the United States or in Europe, where they have homes and businesses, but they are never subjected to questioning by municipality inspectors or get their residency revoked. Between 1967 and 2007 Israel revoked the residency right of 8,269 Palestinians. This “silent transfer” is one way of ethnically cleansing Palestinian Jerusalemites. One time, travelling along the main road in Ubediyyeh with one of my uncles and a friend of his, he shouted at his friend to stop the car at a certain point. To the left side of the road we could see Jerusalem extending on the hills opposite us. My uncle said that this is the best point to see the Dome of the Rock on a clear day and both discussed what time was the best time and from which point exactly. What drew my attention wasn’t the fact that one could see the Dome of the Rock from here, because I could see the Dome from the roof of my house. It was the excitement I could hear in my uncle’s voice and that of his friend. Men, who had been often imprisoned, tortured and injured, sometimes seriously, by the IOF, filled with excitement at the prospect of seeing the Dome of the Rock “on a clear day”. This uncle had been shot in the chest by the IOF with a live bullet, in the head with a rubber bullet and his kneecap was completely crushed during the first Intifada, to mention a few of his injuries. He has a 70% handicap in his leg and is in pain most of the time, which he often tries to hide so as not to worry his wife and children. Is this what they had been imprisoned, tortured and injured for? No, it wasn’t, because I know that to them independence without the Right to Return and without Jerusalem is no independence, but a farce. As I stood on the roof and watched Jerusalem stretch in front of me, with the sun reflecting on the golden Dome, I felt angry and felt how unfair the world is. I was born in Jerusalem, went to school there and practically grew up there knowing almost every corner, every street and every alley in it. I have more memories in Jerusalem than any other place in the world, all cherished ones. But now, I am not allowed into the city anymore because I am Palestinian. As I stood there, with tears in my eyes, I envied every Palestinian with an American or European passport, because they can come and visit Jerusalem. I envied every foreigner who can visit the city whenever they choose. I even envied the birds singing on the cypresses before me, because they could fly over Jerusalem and fill their eyes with its beauty and their lungs with its air. In my childhood, Jerusalem was the only major Palestinian city I knew well and loved. In the eyes and mind of a child, to me Ramallah was a cold city, Bethlehem was the “village” nearby, Nablus and Hebron were the places “to visit my uncles in Israeli prisons” and Jericho was too hot. Only Jerusalem was perfect: with its bustling Old City, the old bus station, Salah Al-Deen Street, Al Musrarah, the walk to the Notre Dame, the walk down Wadi Al-Joz and up to Al-Tur and the walk up to Ras El Amoud. I walked on the roof and saw the mountains on the Jordanian side, clearly visible during mild weather. Late afternoons, coming back home from school, one would witness a breathtaking sight going down the steep street in Sawahreh: a marvellous mixture of simple houses, some with old traditional domed roofs, barley fields or olive groves spreading against a curtain of mountains. Between the mountains and the last of the houses a strip of blue was visible. We always thought it to be the Dead Sea. Well, I personally still like to think of it as the Dead Sea. It was a combination of colours that rarely showed itself, but when it did, it was truly breathtaking. To the south I could see Mount Herod in the distance. I have watched this artificial mountain since my childhood and always wondered at its shape. It always looked far away to be reached, but at the same time so close, an integral part of the view surrounding my home. I used to think about the impossibility of climbing that mountain, because it had steep sides, one would keep slipping and would never reach the top. I did “climb” that mountain years later, during the work on a TV documentary on Bethlehem. During the 2002 IOF invasion of the West Bank, my parents told me that Israeli fighter jets used to pass over Sawahreh on their way to Bethlehem. After a few minutes, the sound of explosions would rock the sky, as the IOF bombarded Bethlehem and the surrounding towns, villages and refugee camps. Since hearing this, every time I see Mount Herod I can’t help thinking of Israeli jets on their way to destroying yet another part of Palestine and kill innocent unarmed civilians. In Sawahreh, Israeli jets roaring in the sky were always a common thing. Some of Sawahreh’s vast lands had been confiscated for so-called “security reasons” and were used as a training area for the IOF. We would often hear sounds of explosions and the house would shake, or hear Israeli jets coming and going. One time, my sister, my brother and I thought that they were preparing for war, and since we had no army of our own, had no jets or tanks or bombs to protect ourselves, we held a meeting to decide on the best way to protect the family. The only solution we could think of was to build an underground shelter. I don’t know where we got the idea of a shelter from, since Palestinians have no shelters, but most probably from one of those WWII films the Israeli TV kept showing. We did start digging, using our hands and small pointy stones, but realized after a while what a lengthy and hard process that was, and instead decided that in case a war does break out we would use the water well as a shelter, i.e., after removing all the water. One would think what a beautiful view, Jerusalem on one side, Bethlehem on the other with mountains and an imaginary sea in the background. Unfortunately, this scenery is interrupted by the Jewish illegal settlements Maale Adumim and Kidar, spreading themselves on Palestinian hills. 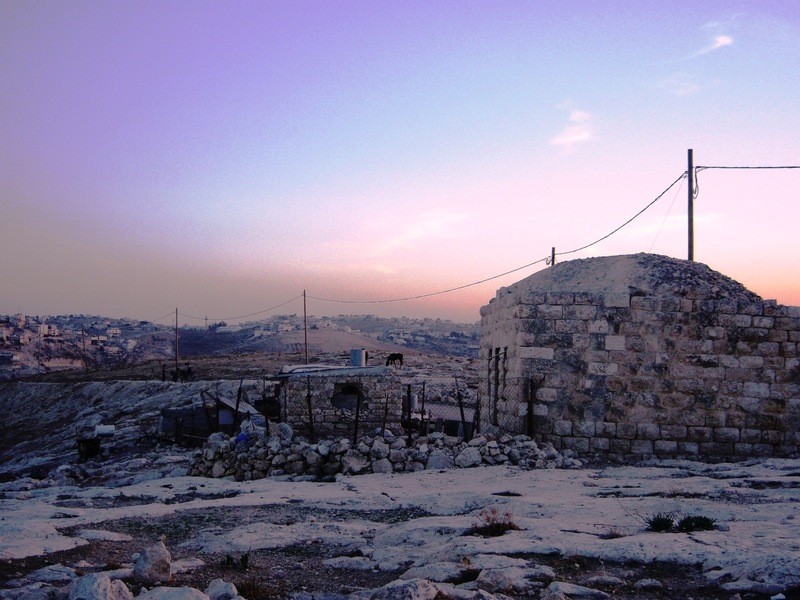 Many Palestinian villages and town are surrounded by illegal Jewish settlements. Some are surrounded by settlements from one, two or three sides. Others are surrounded by illegal settlements and the Apartheid Wall. Sawahreh is surrounded by the illegal settlements of Maale Adumim from the northeast and Kidar from the east and by the Apartheid Wall from the west. Kidar settlement is the closest to us. Before the first intifada, Kidar settlers used to come and walk through our main street, among Palestinian houses. So sure they were of themselves, acting as if the land belonged to them. I remember once we were playing in the land, when a group of settlers walked up the street. We stopped playing and just watched them. I didn’t understand settlers and settlements much at the time, but I remember knowing that these people had no right to walk on our streets. We used to spend our holidays in Dheisheh refugee camp, where the IOF would shoot to kill little children, and then we would come back to Sawahreh, where settlers were walking our street. Those close to Kidar used to sell home-made white cheese and yoghurt to the settlers, who thought us too quiet and peaceful, so they called us “Kiryat Shalom” or the village of peace. It was something I always felt ashamed of, knowing that the settlers thought us too peaceful to bother with, while their army and their fellow fanatic settlers were attacking Dheisheh and killing people there. If the illegal settlers of Kidar were so very interested in peace with us, why did they steal our lands to expand their settlement, knowing that our livelihood depended on these lands? You can’t have peace with your occupier, because the only peace they will offer you is a masquerade, not a real and just peace. In Palestine, power cuts are a regular thing, and whenever we had no electricity and had to study using candle light, which often hurt our eyes, I used to look through the window and watch Sawahreh, Abu Dees and Ezariyyeh drown in complete darkness, while Kidar and Maale Adumim would be lighted like a Christmas tree. Even as a child this made me think of how unfair the situation was and that these settlers and these settlements don’t belong here. I remember as a child how “far away” Maale Adumim seemed. But as I grew up, so did the illegal settlement. The danger of this expansion never really registered in my mind until one night I dreamt that I opened the window of my bedroom to find myself looking into the courtyard of a Jewish house. The settlement had eaten the land all the way from where it stood till our house, and our house and the land surrounding it was next. I woke up sweating and my heart beating fast. So real was the threat, I realized at the time, that I knew it was not a mere nightmare. The next day I went at the back of the house to the spot where one could get a direct view of Maale Adumim and tried to calculate how much time we had before my nightmare became reality. I thought we still had time to act, but I was mistaken. Since the 1990’s the settlements have been expanding and are eating more Palestinian land at an unprecedented pace. In this area there are several illegal Jewish settlements such as Maale Adumim, Alon, Almon, Kidar, Kefar Adumim and Mishor Adumim, with a combined population of some 40,000 settlers. 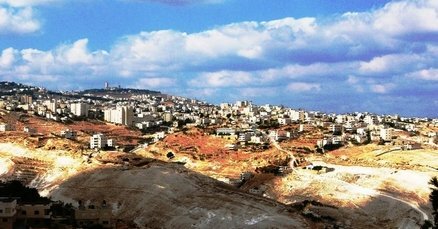 The largest, Maale Adumim was established in 1975 on confiscated Palestinian land and lies 14 km to the east of Jerusalem. It has a population of 35,000 illegal Jewish settlers and a jurisdictional area of 50 km². 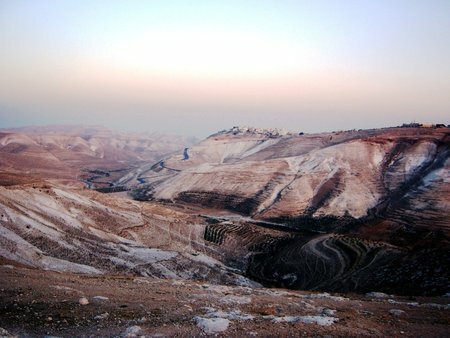 Road networks have been also established to connect Maale Adumim and neighboring settlements with Jerusalem and with the Jordan Valley. Palestinian land would be confiscated, declared a “closed military zone” and later used for illegal settlement expansions. On the day of my arrival to Palestine for a short visit, I watched in shock as I passed Maale Adumim at how huge it has become. Within the space of two years, since my last visit, it had doubled in size, to say the least. Standing there on the mountain top, with a wall surrounding parts of it, it reminded me of a fortress from the middle ages. Although I am a fan of fortresses, this one brought only anger and disgust. The lands opposite it, which I distinctly remember were planted with olive trees, had become bare land, the trees uprooted and the land destroyed to make way for more illegal settler houses and roads. 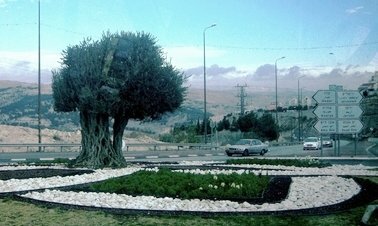 At the entrance to Maale Adumim stood a single olive tree, as huge as life and older than any illegal settler on this land. It was clear that this tree had been uprooted from some Palestinian field, maybe even from our confiscated land, and replanted here. Macabre, I thought and could only shake my head at the sad view of that lonely olive tree. Olive trees are like Palestinians, they grow in groups, surrounded by family and friends. That tree stood there alone, a reminder to every Palestinian that this is what the so-called peace process had done to us, and that if this process is allowed to go on, every single Palestinian will end up like that tree, alone and uprooted. 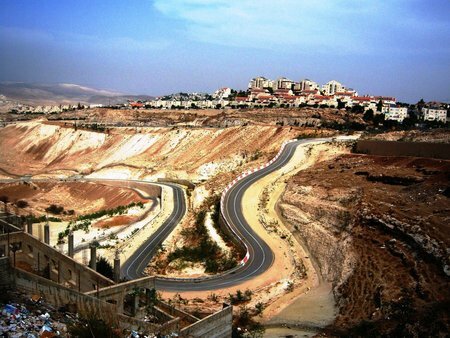 The plan to expand Maale Adumim, known as the “E-1” Plan, which was initiated by Rabin in 1994 and approved in 1999, led to the confiscation of yet more Palestinian land. This Plan is an important part of the “Greater Jerusalem” scheme, which includes Maale Adumim, Beitar, H´Givat Ze’ev, Gush Etzion, the Ariel bloc, the Hashmonain bloc and the Jordan Rift, and aims at annexing large areas of the West Bank to Jerusalem. This plan expands the jurisdictional boundaries of Maale Adumim and its satellite settlements to the Israeli Jerusalem municipal boundaries, linking Jerusalem with surrounding settlement blocs and linking the Maale Adumim bloc with with other settlement blocs such as Pisgat Ze’ev, Pisgat Omer, Neve Ya’acov and the French Hill. Also, a wall is being built around Maale Adumim and its satellite settlements, which will completely encircle East Jerusalem and 61 km² of Palestinian land. The “E-1” Plan aims to completely cut off Jerusalem from the rest of the Palestinian Territories, disconnecting the geographic contiguity of Palestinian Territories by dividing the West Bank into two parts, thus ensuring that no viable Palestinian state would ever come to existence. Last year, roads were paved and a bridge, main junctions, public squares, police stations, checkpoints and side walls were built in the “E-1” area. This area will cover some 13,000 dunums confiscated from Palestinian villages around Jerusalem and is to house an additional 15,000 illegal settlers. Two Israeli-only roads will connect settler roads southeast of Bethlehem with roads to the northeast, including connecting Maale Adumim and other Jerusalem settlements with the Ramot Ashkol settlement. For the construction of these roads, tens of houses in Sawahreh, Abu Dees and Al Tour are to be demolished. To prevent Palestinians from entering Jerusalem or using Road Nr. 1 that passes through the E-1 and Road Nr. 60 that passes through East Jerusalem, an “alternative” road is being constructed for Palestinian use and is to connect the Southern West Bank with its Northern part. 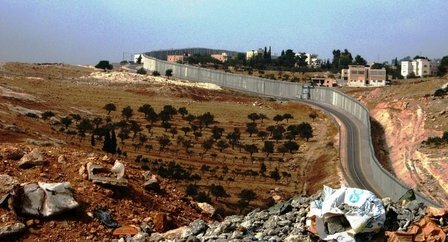 For the construction of this road, the IOF issued a military order in 2007 confiscating 1,128 dunums of Palestinian land from villages between Jerusalem and Maale Adumim, i.e. 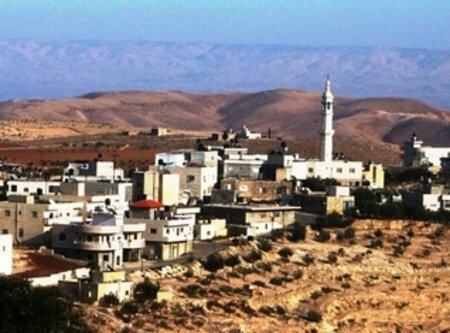 Sawahreh, Abu Dees, Nebi Musa and Al Khan Al Ahmar. Blocking the southern entrance of Sawahreh is the “Container” checkpoint, which is now being expanded to become a permanent border-like crossing. Passing the checkpoint, one would not imagine what beautiful landscape lies behind the Israeli stone blocks and control tower. Locally, we call it “Barriyeh”, the wilderness or the prairies. Green meadows decorated with red poppies wherever one looks. My favourite spot there is a low area, surrounded by hills and naturally-formed stone structures. Here, running was not possible because of the tall vegetation that covered the place. We would imagine ourselves swimming and race each other or play hide and seek. Then, when we would feel hungry, we would have something to eat under the olive trees. Relics of family history decorate caves in that area and cherished memories of childhood lie behind the checkpoint, making them off-limit to us. The last time I went there was just before leaving for Germany and I had not set foot again. Our lands there, including the olive fields, which were a source of income for my family, were confiscated in 2003. Today, only those few who originally had their houses behind the checkpoint are allowed in, but no one knows how long before their houses will be demolished for some reason or other so as to close the area completely. The “Container” checkpoint is a passage between the north and the south of the West Bank. It is one of more than 630 Israeli checkpoints and road barriers all over the West Bank, aiming to restrict Palestinian movement on Palestinian land. Travelling to the south, one would have to take the “Wadi Al-Nar” road. Wadi Al-Nar, the Valley of Fire, is most probably called so because of its steepness and the danger of driving there. It was a dirt road connecting Sawahreh with Ubediyyeh, rarely used except maybe by villagers travelling on donkeys. With the signing of the so-called peace process, Jerusalem was closed to most Palestinians and this road was used instead as a link left between the south and the north. If one is stuck behind a truck on that road, the meaning of “Valley of Fire” becomes clear, for when driving up the road, one has the continuous feeling that the truck will turn over any minute and everything behind that truck would be squeezed underneath it. As children we would follow the shepherds with their herds whenever we could. We would eat figs, search for snake nests in caves and play at the old ottoman stone circles. Every time we were there on the hills, we would go exploring a bit further. It was mostly steep hills, where we learned to slide slowly down a hill, using our left foot as a break. Here, there were no illegal settlements and no IOF soldiers, or at least they were not visible. When it was time to go home, instead of taking the direct way, we would go all around the hills, passing the “sacred river” to the old Sawahreh houses and further back home. The “sacred river” as we called it, was a small “river” running through the Wadi Al-Nar. Greenery was along both sides of this river, giving it a genuine river look, like those we used to see in cartoons. The vegetables growing around the riverbanks were double the size of the ordinary vegetables we would buy from the supermarket. Later, and to our great disappoint, we found out that the reason for the extraordinary growth of these vegetables was the waste water. This “sacred river” was actually the flow of waste water from Maale Adumim and other settlements in the area. Not only was their waste water contaminating our lands, their solid waste was being dumped and burned on our lands as well. Several studies have shown that illegal Settlements comprise a major environmental threat. Waste water and industrial waste from settlements is dumped on Palestinian lands, contaminating the soil and the water supply. Palestinian plans to treat waste water are usually rejected by Israel, and in one incident Israel insisted that a treatment facility for Tulkarem be built on the other side of the Green line, for no other reason than to use the treated water for its own interest. During my last visit to Palestine, I wanted to see these hills again and enjoy the beauty of a Palestine that was free of illegal settlements and IOF checkpoints. It was late afternoon and as I looked around me I saw Mount Herod in the distance, with Palestinian villages decorating the hills all the way from there to Jerusalem. And opposite them, Palestinian hills extended all the way to meet the Jordanian mountains in the horizon. There was no Apartheid Wall, no IOF checkpoints and no settlements. Although I knew they were there, breaking the natural bond between Jerusalem and the rest of the West Bank, they were not visible from where I stood. I saw the old stone houses with the traditional domed roof, a herd of sheep with a shepherd who was playing the flute, the sunset adding a magical touch to the whole landscape, and there, at that moment I felt what it would feel to live in a truly free Palestine. I started taking photos and wondering how long before the Israelis would wipe out this landscape and all traces of Palestinian existence here. I went home, thinking that the Palestine I grew up in is not the Palestine of today. The Palestine of today is the rest of the so-called peace process with its illegal settlements, the Apartheid Wall, the IOF checkpoints and “Herrenstraßen” that are eating Palestine from inside, like a cancer, destroying the land piece by piece. I remembered that lonely olive tree in front of Maale Adumim and hoped that those still disillusioned by the “peace process” would wake up and act before it was too late.